At least 1,000 white nationalists are expected to attend the rally. Virginia Gov. Terry McAuliffe has placed the National Guard on standby in preparation for a rally in Charlottesville on Saturday, where at least 1,000 nationalists are expected to attend. The Unite the Right rally is scheduled to take place Saturday at McIntire Park in Charlottesville, the city said on its website. The Anti-Defamation League (ADL) said in a statement that the event could be the "largest white supremacist gathering in a decade." McAuliffe said in a statement that while he believes the majority of the rally's participants will express their views "safely and respectfully," he believes that some attendees may be violent. “Virginia is the birthplace of the rights to freedom of speech and peaceful assembly that make our country great," McAuliffe said. "...However, in advance of tomorrow’s rally, there have been communications from extremist groups, many of which are located outside of Virginia, who may seek to commit acts of violence against rally participants or law enforcement officials." The "alt-right" movement is characterized by a mix of racism, white nationalism and populism, according to The Associated Press. McAuliffe urged residents who plan to attend -- whether in support or opposition of the rally -- to make alternative plans. "Many of the individuals coming to Charlottesville tomorrow are doing so in order to express viewpoints many people, including me, find abhorrent," he said. "As long as that expression is peaceful, that is their right. But it is also the right of every American to deny those ideas more attention than they deserve." The American Civil Liberties Union (ACLU) is representing the event's organizer -- right-wing blogger Jason Kessler -- in a lawsuit filed Aug. 10 against the city of Chartlottesville and City Manager Maurice Jones. The suit claims that Kessler’s first amendment and constitutional rights were violated because on Aug. 7, city officials initially tried to revoke his original event permit, and then changed the location of the event. The city claimed that this was a result of the high number of expected attendees, and not because of public pressure to stop the rally from taking place, Claire Gastañaga, executive director of the ACLU of Virginia, told ABC News. While Gastañaga said the ACLU disagrees with Kessler's speech, she criticized city officials for attempting to revoke the permit without due process. "We think it's important the government make decisions in the sunlight," she said. A representative for the city of Charlottesville did not immediately respond to ABC News' request for a comment in regard to the lawsuit. The rally is expected to draw at least 1,000 participants, according to an affidavit from Charlottesville Police Chief Al Thomas, which was provided to ABC News from the ACLU. Emancipation Park, the original event location, would have been unable to accommodate a peaceful crowd safely, Jones said in an affidavit. "There is no doubt that Mr. Kessler has a First Amendment right to hold a demonstration and to express his views," the city manager wrote in a statement on Aug. 7. "Nor is there any doubt that we, as a city, have an obligation to protect those rights, the people who seek to exercise them, and the broader community in which they do. We have determined that we cannot do all of these things effectively if the demonstration is held in Emancipation Park." Large crowds are also expected in downtown Charlottesville on Saturday, the city said, with high numbers of protesters demonstrating against the rally expected to be among those in attendance. When Kessler applied for the permit on May 30, he proposed the event as a "free speech rally in support of the Lee monument," according to Jones' affidavit. The city has plans to remove a statue of Confederate General Robert E. Lee from Emancipation Park, which was formerly known as Lee Park, according to the complaint. "Just as the Unite the Right participants have the right to air their views, so do those who want to protest against those views," said Charlottesville Mayor Mike Signer in a statement. "Democracy can be noisy, and it can be messy. But by ensuring we protect both public safety and the Constitution through the city manager's decision, I firmly believe that we will emerge from the weekend of August 12 a stronger community than ever." ADL CEO Jonathan A. Greenblatt said the organization agrees with Signer. “The white supremacist rally in Charlottesville is the latest indication that the darkest corners of society are emboldened to come forward and openly parade their bigotry on main street,” said Greenblatt. “We continue to stand with Charlottesville Mayor Signer and those who reject intolerance. Hate has no place in our communities." (Allison Wrabel/The Daily Progress) Torch-wielding protesters gathered at Lee Park in Charlottesville, Va., Saturday night, May 13, 2017. 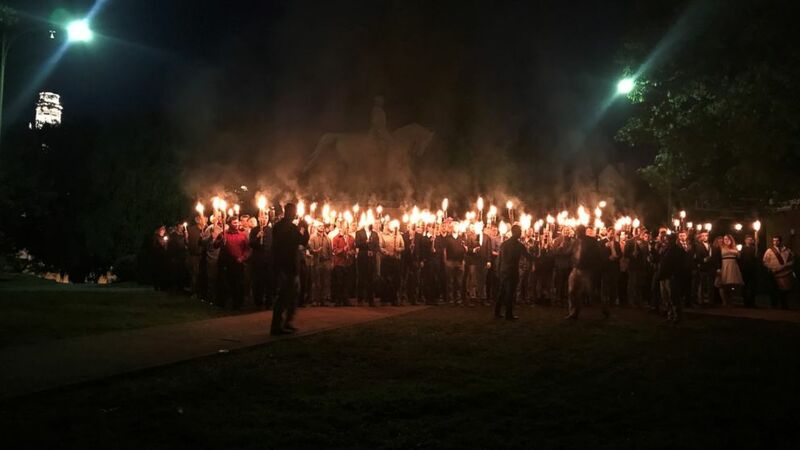 On May 13, noted white nationalist Richard Spencer led protesters with torches in a Charlottesville rally against the planned removal of Confederate statues in the city.